Located in the heart of the Kashmir valley nestling in the misty Pir Panjal ranges of the Himalayas, Srinagar has been holding a magical allure for visitors with its exquisite scenery in the form of snow-capped mountain vistas and placid lakes. The beauty of Srinagar is enhanced by the Jhelum river which separates the city into two parts. Enjoying the unique accommodation in indulgent houseboats and leisure-rides in the gaily painted shikaras in the stunningly beautiful lakes in the capital of Jammu and Kashmir will in all certainty be an unforgettable affair. The Mughal era gardens and distinctive Kashmiri wooden mosques are the cherries on the cake. One of the three Mughal gardens in Kashmir, Chasma-i-Shahi is the smallest of them. Located 9 km from Srinagar on the way to the Buddhist site of Harwan, this aesthetically desfined Mughal garden was completed during the reign of fifth Mughal emperor Shah Jahan, the builder of Taj Mahal. 7.5km from Nehru Park, Nishat Bagh is located on the banks of the placid Dal lake with the Zabarwan mountains forming its backdrop. Designed in 1633 AD by Asaf Khan, brother of Jahangir’s consort Nur Jahan and father of Shah Jahan, it commands a stunning view of the lake and the snow-capped Pir Panjal mountain range. 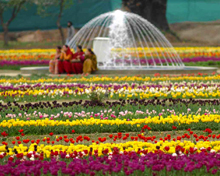 Featuring steeper terracing, Nishat Bagh, this aptly named “garden of bliss”, is studded with rows of mighty Chinar Trees, water channels interspersed with fountains and tanks, and vivid coloured flowerbeds all of which combine to enhance the picturesque setting of the garden to a great degree. The largest of the Mughal gadens in Kashmir, the famoius Shalimar garden was laid out in 1619 by the fourth Mugghal emperor, Jehangir, for his consort Nur Jehan. 539 long and 132 metres wide, Shalimar Bagh is known for stunning vistas, four terraces one above the other, fountain pools and carefully manicured flowerbeds interspersed with stately chinar trees. 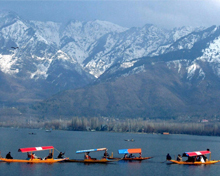 The emblem of Kashmir tourism, Dal Lake lies to the east of Srinagar at the foot of the Shridhara (Zabarwan) mountains. A stuff of poetry, the lake is 8 km long and 4 km wide and is divided by causeways into four parts. Gagribal, Lokutdal, Boddal and Nagin. Lokutdal and Boddal each have an island in the centre, named Rup Lank and Sona Lank . Rup Lank is also known as Char Chinari. 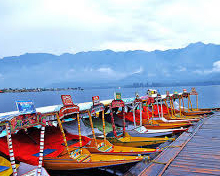 What makes Dal Lake a compelling destination is the presence of ornate houseboats on its shores. These the “floating palaces” were introduced by the Briritsh who used to take refuge in them to escape from the sweltering heat of the plains. Take a majestic leisure-ride in the shikara wooden taxi boat which will give a laidback feel amidst the stunning surroundings. The ruins at this Buddhist site captivate the visitors for being the place where the great scholar Nagarjuna, an authority on the Mahayana form of Buddhism, lived in the 2nd century. Located adjacent is the beautiful Harwan Gardens offering breathtaking view of the surroundings. 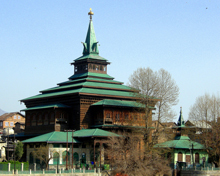 Located on the western bank of the famed Dal lake Hazratbal shrine is venerated for containing a sacred hair of Prophet Mohammad which is displayed to the public on special religious occasions. This beautiful white marble shrine commands a spectacular view of the lake and the mountains. What is unique about the Hazratbal shrine is that it is the only domed mosque in Srinagar. A fine specimen of Indo-Saracenic architecture, the Jama Masjid was constructed by Sultan Sikandar Shah in 1388 A.D. and enlahanced by his son, Zain-ul-Abidin, the greatest of the Muslim rulers of Kashmir. Built by Atta Mohammed Khan, an Afghan Governer in the 18th century, the fort is not accessible to the public. On the western slopes of the Hari Parbat hill is a shrine dedicated to Goddess Durga. On the southern slopes of the hill is located the venerated Muslim Shrine of Khwaja Makhdoom Sahib where visitors come to pay their obeisance. This 5 domed brick structure is a peculiar piece of architecture dating back to 1421-1472 A.D. Within it, lies buried the mother of Sultan Zain -ul -Abidin. Looking more Bulgarian than Kashmiri, the multi-domed 15th-century brick tomb of King Zeinalabdin’s mum was built on the plinth of a much older former Buddhist temple. Located on a top of Zabarwan Mountains near Cheshmashahi,, Pari Mahal or the Fairies' Abode is a garden built by Shah Jahan’s eldest son Dara Shikoh for the Sufi saint and his teacher, Mulla Shah. Dara Shikoh was executed on the order of his famous brother and Mughal emperor Aurangzeb. Located on bank of the River Jhelum in Nowhatta region of Old Srinagar, this stone mosque was built on the instruction of Nur Jahan, consort of the Mughal Emperor Jehangir, in the 16th century. 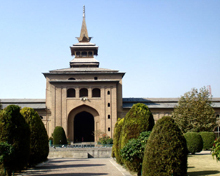 Since the mosque is built of stone whereas majority of mosques in Srinagar are wooden structures, it got its name as Pathar (Stone) Masjid. One of the oldest mosques in the city, Shah Hamdan Mosque was built in 1395 by Shah Sikandar in the memory of Mir Sayyid Ali Hamdani, more famously known as Shah Hamdan, a Sufi saint and scholar from City of Hamdan in Persia. Situated on the banks of the river Jhelum in the centre of the Srinagar city, this monument is characterised by fine papier mâché work on its walls and ceilings. What is more interesting about the mosque is that not a nail or screw was used in its construction despite being built of timber. Situated atop the Takht-i-Sulaiman hill in the Zabarwan Mountain, the shrine is built on a high octagonal plinth and is dedicated to Lord Shiva. Visited by the famous Hindu scholar Shankaracharya, the temple is very ancient and can be reached by flight of steps. Once the summer palace of the Kashmir Maharajas, the museum is a repository of paintings, Ladakhi handicrafts, shawls, silver images, ornaments, arms and armoury. The archaeological objects which are on display at the museum are terracotta tiles, pottery and metal etc. The piece de resistance here is a map of Srinagar done in needlework. On the foothills of Zabarwan mountain is located the Asia's largest tulip garden known as Indira Gandhi Memorial Tulip garden. Occupying an area of about 12 hectares, the garden is the habitat of more than 100 varieties of early, mid, late and very late blooming tulips, spreading a rainbow of red, orange, purple, white, pink, parrot and yellow colours. Srinagar airport is connected by flights with major cities of India including Mumbai, Delhi, Jammu and Leh. The nearest railhead is Jammu (293 km) which is connected by rail with all major cities in India. Srinagar is connected by motorable roads with different parts of the country.